Heading back to the La Belle Forme clinic is like being reunited with a good friend, they are just the friendliest bunch and the atmosphere in there is always so positive and welcoming. Even though there are people coming in and out who are having treatments of a varying scale there isn't any nervousness surrounding you which I think it really important when you are making decisions on your appearance. I absolutely love settling in with a cup of tea and just taking time to peruse all the leaflets they have sitting out explaining the variety of treatments on offer and there is always a happy staff member ready to share what amazing results they have seen with clients recently or share their own personal experiences. For this consultation I was meeting with Laura who is a hoot to deal with, with years spent as a nurse in one of Glasgow's busiest hospitals she has a fantastic bedside manner for reassuring you over even the smallest procedure, her warmth and knowledge is such an asset. 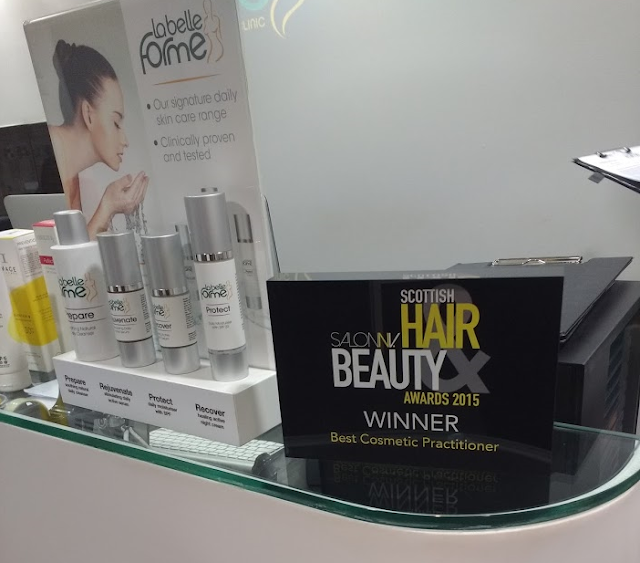 She also just happens to be this years Scottish Hair and Beauty Awards winner of the best cosmetic practitioner award which is an amazing achievement and so well deserved as she is incredible at what she does. We had a chat through where my skin was at and where I would like it to be and Laura gave me the run down on the kinds of treatments I could be considering to help me achieve those goals. I hopped on to the treatment bed and she cleansed my face and took a good look at my skin while asking me about any concerns I might be having at this stage in my life and was really good at understanding my fears about certain procedures. A consultation here is just so useful in getting someone in the know to give you an honest perspective on what is achievable and what other tips you can bearing in mind to help such as skincare. With a lot of my pigmentation gone it is the early signs of ageing that I am starting to notice. I am turning 30 next year ( GULP) and I am well aware that is by no means old but I have certainly noticed changes in my skin in the last year or so that I would like to make sure I am keeping on top of. Thanks to a recent bout of adult acne twinned with a frustrating skin infection I have had, there are two areas really plaguing me currently, acne scarring and some dreaded wrinkles! The deep lines I have between my eyebrows from years and years spent refusing to wear my glasses which I now could not be more annoyed at myself for, are a constant course of irritation for me. Although I am well aware are not the end of the world they consistently bug me, my make up gathers in them and I just felt they age me generally. Laura was amazing at taking a good look at these areas and suggesting a plan for helping take care of the issues and I am so excited to get started and compare some before and afters.